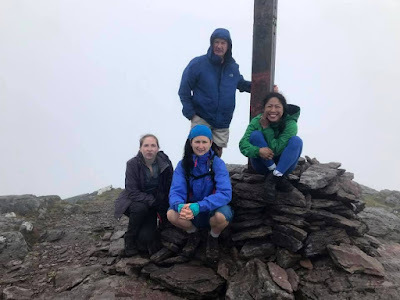 One of our Big challenges planned for this year was to do the whole Reeks starting from the Hydro Road and finishing at Kate Kearney's Cottage. Now, we have to say here that we don't like the Hydro Road.... and we don't like climbing Caher, but the alternative route which would be up Cnoc Iochtair and Skregmore following to Beenkeragh is longer and more difficult and adds more time to the trip. Having in our minds that we had two cars, one parked by the hydro road and the other at Kate Kearney's, we had two options at this stage: go back or go forward, but we knew as well that if we went forward there would be no going back... We decided to be proper hard cores and off we went making our way down Carrauntoohil and towards Eastern Reeks. There's something about Eastern Reeks in poor visibility... It's really easy to get lost there in the fog. 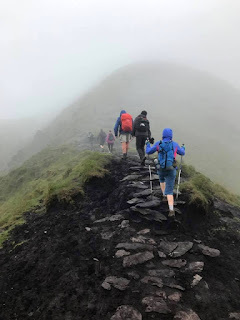 Some of us can still remember getting misplaced while going down The Bone route from Maolan Bui last year and ending up in some steep gully... Once you pass Cnoc na Toinne and the top of the zig-zags route to the left, the path becomes not so obvious in places, disappearing between rocks and stones further on the ridge after passing Knocknapeasta. We met a small group of walkers wandering and looking for the zig-zags route. We actually saw them passing the stone cairn and going too far just a few minutes earlier. 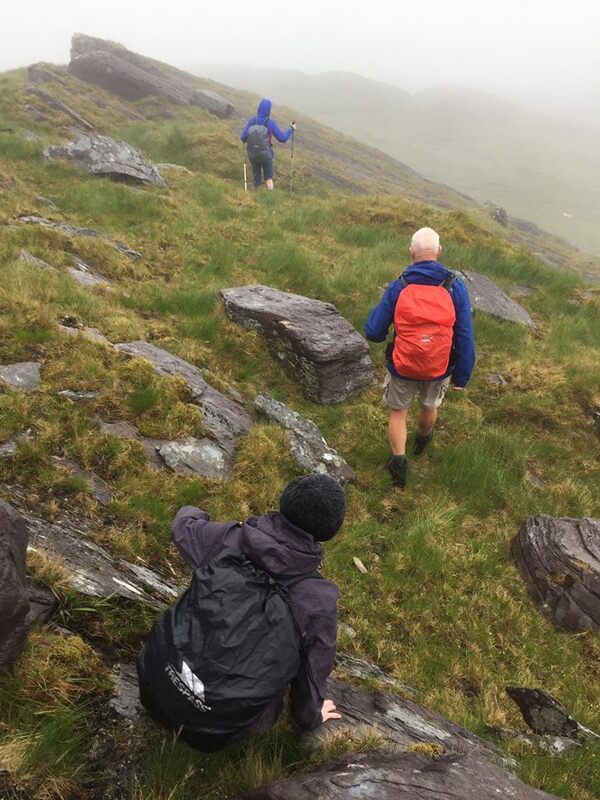 They weren't even dressed properly for the mountains, not to even mention having any leader with navigation skills. We told them to go back and be sure not to miss the cairn this time. 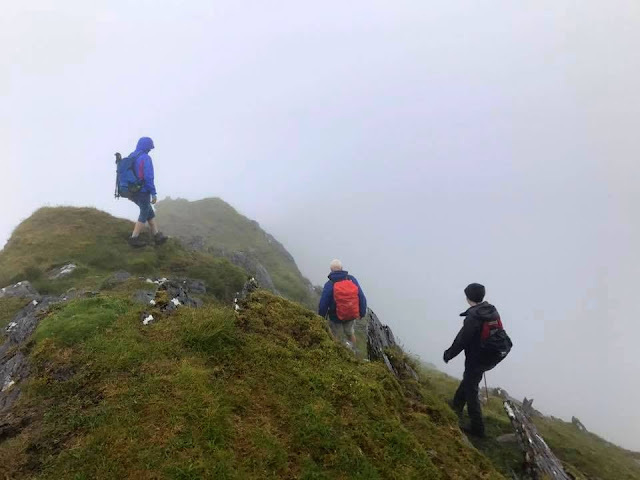 It all happened when Denis started avoiding the exact ridge line to keep the group safe in this conditions. Myself (Anna) stayed on the top of the ridge and followed it to the summit of the Big Gun. Avoiding the ridge brought Denis too low and too far to the right. After contacting him I went back and then down a good bit to meet them. After looking at the map and discussing our current location which was the south eastern spur of The Big Gun going down to Lough Googh, we decided that we had enough of that rain and quickly planned our escape route. We descended to the lake, getting out of that cloud and then followed the river to the road. 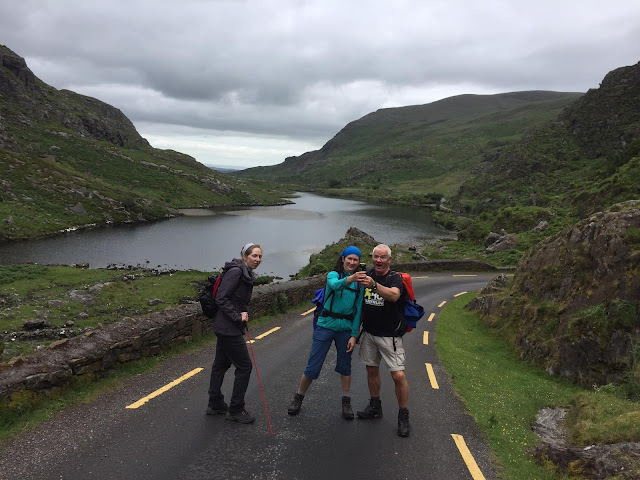 From there we walked through the Gap of Dunloe to Kate Kearney's Cottage. 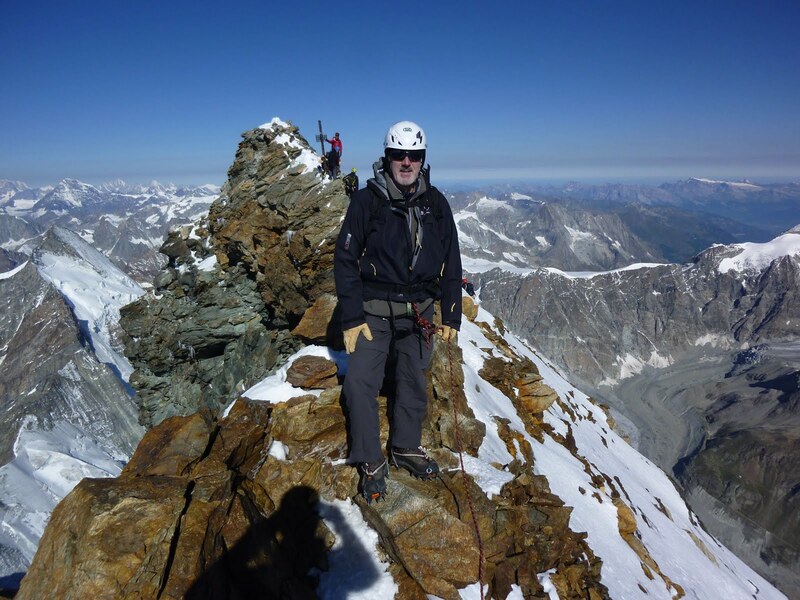 It was the best decision not to go back up from the place where we met again with Denis as the rocks on the ridge were very slippy and uneasy to scramble. In this bad weather conditions I didn't feel comfortable enough on the ridge that I haven't done before and both of us, myself and Denis knew, that the others wouldn't be happy to continue.